It's time for the next Holiday Chaos theme at Catch the Bug and it's Ugly Sweater day with three possible recipes for making your card. I went really literal on the "Ugly Sweater" theme as well as using one of the recipes. I used Glitter/ 3 buttons/ & ribbon. 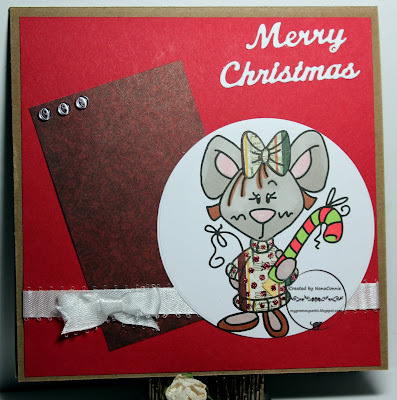 The mouse image is from Bugaboo Stamps. I started with the sketch from Try Stampin' on Tuesday. I colored the image with ProMarkers, but paper pieced the ugly sweater and her hair bow. I added tiny dots of glitter to the sweater. 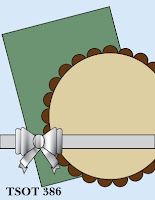 The image was cut with a QuicKutz die, as was the rectangle of dp. I cut the sentiment with a die from Die-Versions. The ribbon is from Crafty Ribbons and the three, tiny buttons were in my stash. So adorable- and LOVE that you included a real Ugly sweater : ) Love the sketch too. Thanks for joining in the challenge at Catch the Bug! I have not been on the computer as much as before- miss seeing what you are up to! love your mouse with the ugly sweater! What a fun card - great colouring of the little mouse - thanks for joining us at TSOT this week. Another beautiful card Connie, love the image and you interpretation of the sketch. Well, your cute little mouse sure makes "ugly sweater" look sweet, lol. Great job! Thanks so much for playing at TSOT!